The International Consortium of Investigative Journalists (ICIJ) has been analysing its Offshore Leaks Database since the early 2012 and has published results of several in-depth investigations. Because of the sheer size of the database, ICIJ has been collaborating with news organisations around the world on its analysis. It has also made some of the data publicly available to crowdsource even more investigation efforts. ICIJ encourages the public to help validate the contents of the database and to pursue its own investigations, especially in smaller countries which may fall under the radar of big news organisations. ICIJ’s publicly available database is only a small portion of the leaked materials. Financial transaction data and much personal information has been removed. Most data on clients in China, Hong Kong and Taiwan has also been temporarily removed while investigators are working on them. What remains is by no means a complete or even a representative picture of offshore finance. Its value is in the ability to identify names of individuals involved in offshore finance and the often extensive networks of financial entities they have set up to cover their steps. By clicking on an entry in the table, it is possible to display connections between individuals and entities in an interactive, visual form. 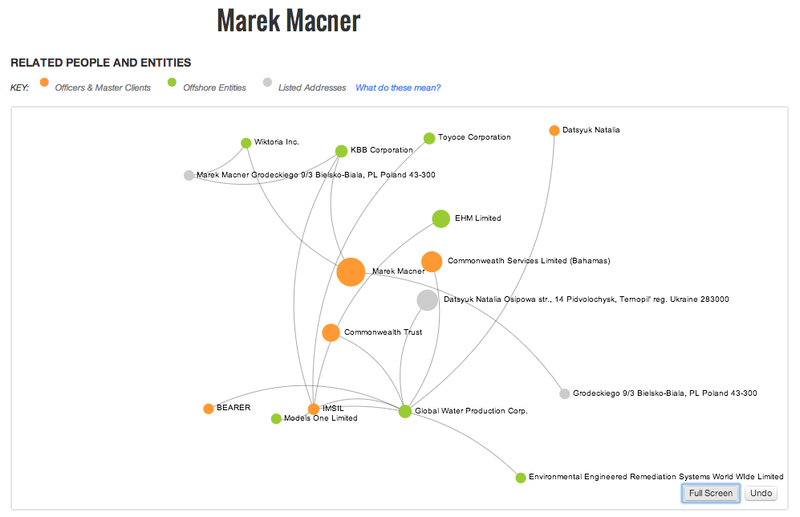 ICIJ is careful to note that the fact that someone’s name appears in the Offshore Leaks Database doesn’t mean that the person is involved in illegal financial activity. Transferring money or financial assets abroad is not illegal by itself. There are legitimate reasons for doing it. However, it is also a way to shelter your assets from taxation or seizure by governments or courts. Certain jurisdictions, for example the Cook Islands, have built offshore finance into a big business and a substantial portion of their economy.